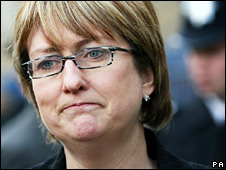 Home Secretary Jacqui Smith has apologised for releasing knife crime statistics too early. She told MPs the government had been "too quick off the mark" in releasing figures suggesting a 27% fall in hospital admissions with stab wounds. Last week ministers said there had been a sharp fall in both in targeted areas. Statistics chief Sir Michael Scholar welcomed the apology but was still disappointed the figures had been published only in part. He had complained officials had asked the government not to release "unchecked" and "selective" figures. The government had already admitted "insufficient attention" was given to the authority's views on releasing the information. At Home Office questions in the Commons, Ms Smith said: "I am sorry that I think we were too quick off the mark with the publication of one number in relation to the progress that had been made with tackling knife crime." A Home Office spokeswoman said later the apology referred to the hospital admissions statistics, not separate figures released alongside them pointing to a sharp fall in teenagers caught carrying knives some areas. Sir Michael had complained the figures had not been through "the regular process of checking and quality assurance" and the statisticians had "tried unsuccessfully to prevent their premature, irregular and selective release". Speaking to BBC Radio 4's PM programme, Sir Michael said he was "very glad" to hear Ms Smith's apology, as he had been to get a letter from the prime minister's office acknowledging errors had been made. But he added: "It said that they'd been too quick in publishing them, actually in my opinion that was one of the errors. "Another of the errors was publishing them in part. They picked out the elements from the statistics that went along with their announcement and they didn't publish the rest." Last week Number 10 and the Home Office said there had been a sharp fall in the number of teenagers caught carrying knives in England and hospital admissions due to knife wounds in areas targeted by police. They pointed to a 17% fall in serious injuries and deaths across nine police force areas over the past six months as well as a 27% fall in hospital admissions. But government statisticians had asked Number 10 not to publish the data until March when the knife crime campaign would have ended and it could be properly checked. The Commons Public Administration Committee is to carry out an inquiry into how the figures were published. Committee chairman Tony Wright, a Labour MP, said their publication had broken the rules for the release of official statistics. The Conservatives and some senior Labour MPs criticised their publication.